MCS Jewelry comprises 25 years of specializing in authentic jewelry which ensures customers with complete satisfaction and outright excellence. MCS Jewelry oversees the production of each piece with our years of expertise to assure our customers that our products are crafted with the highest standard materials and utmost care. Shop with confidence for we guarantee that our expansive selection of high-quality jewelry offers everyday values that range from precious gemstone and diamond pieces, to the latest fashion designs. MCS Jewelry specializes in the creation of highly ductile and malleable gold elegant pieces, ranging anywhere from 10 to 14 karat gold depending on your personal preference. Whether the exquisite piece is for a loved one or a personal indulgence, our products are the perfect gift and will complete any look. Don't settle for cheap imitation when it comes to the quality of your jewelry and make sure to shop with us today! 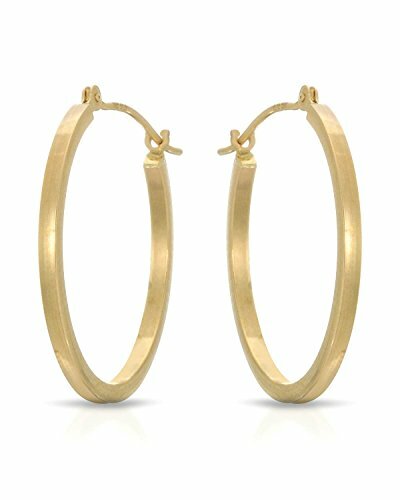 Fresh color, gorgeous and elegant these 14 Karat Yellow Gold Classic Square Hoop Earrings feature a snap-down post closure for secure, easy and comfortable use. Its eclectic design makes it the ultimate finishing piece for absolutely any event. Be it a special occasion or for everyday use, shine with confidence sporting this radiant accessory. If you have any questions about this product by MCS Jewelry Earring Collection, contact us by completing and submitting the form below. If you are looking for a specif part number, please include it with your message.